Dr.Girish Gupta, recipient of many national and international awards, also a member of Central council for Research in Homoeopathy had presented many cases with evidence-based documentations. 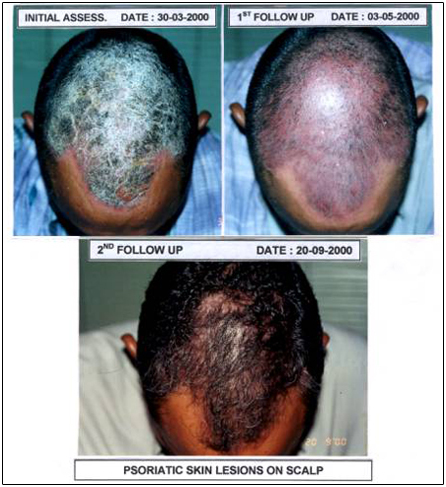 Here we give a case of scalp psoriasis presented by him. He has a scientific approach with determination to do “Something Significant” and redefine Homoeopathy on modern scientific lines. This case had been treated recently and he shares his experience with all. Phosphorus was selected from various drugs of choice. After 6 months of treatment with Homoeopathic drugs psoriatic skinlesions were almost cleared. Psoriatic skin lesions on scalp much better. Fear of thunderstorm, being alone, ghosts, robbers, accident, misfortune, high places, water and crowd reduced. No further reduction in fears.